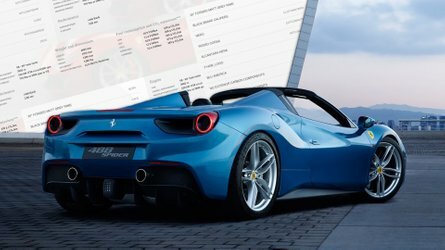 All vehicles are good or bad based on how individuals use them. That fact makes minivans incredibly difficult to evaluate, since they’re essentially created to do every mundane automotive thing fairly well. 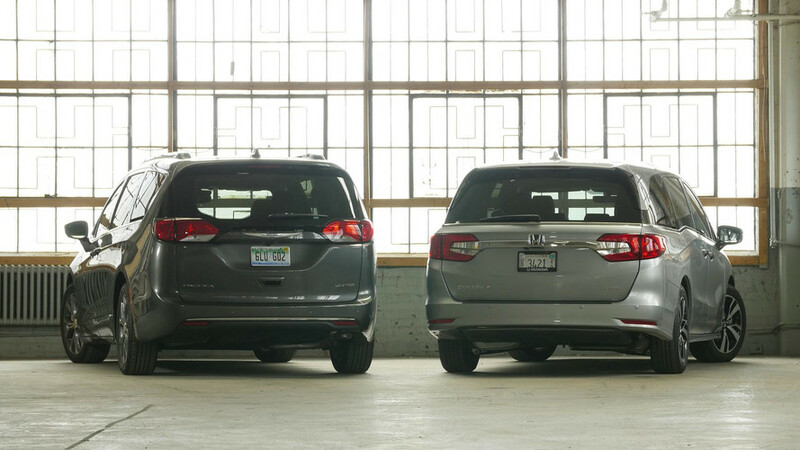 Which isn’t to say minivans themselves are boring. Stuffed with technology and wild features, this segment offers more to actually test and evaluate than any other. That’s why I was so excited to have the 2017 Chrysler Pacifica and the 2018 Honda Odyssey in the Motor1 office at the same time. We’ve praised each of these vehicles in earlier reviews, so driving them both, head to head, seemed like a natural. The only trouble being that, at the end of a comparison test, you kind of have to pick a winner. 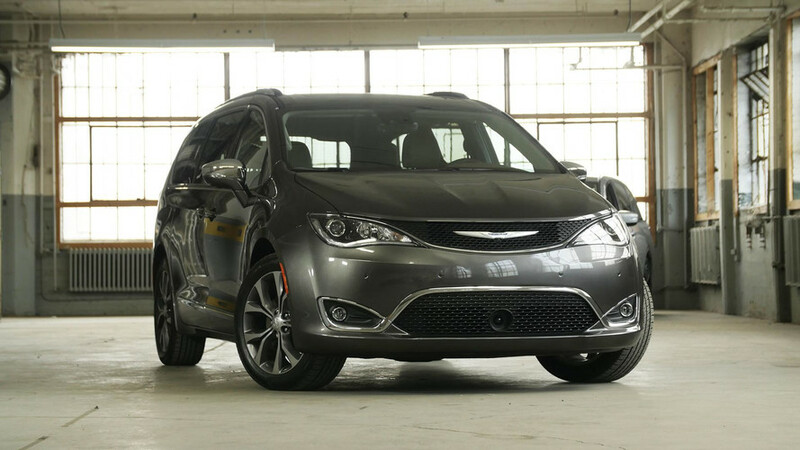 Chrysler: Is this the most attractive minivan shape of all time? 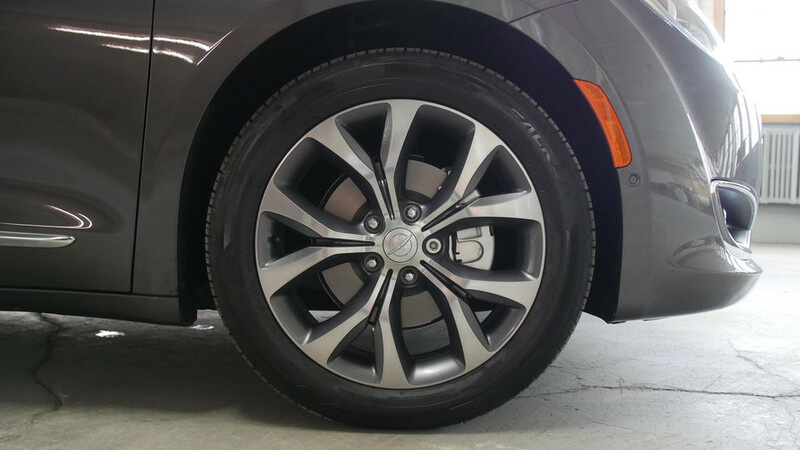 Our own Editor in Chief, John Neff, lavished praise on the Pacifica’s curvaceous shape, calling it “legitimately attractive” along with lengthier design praise. Even in the very plain shade of gray you see here, the shape is tidy and the proportions well considered. The dubious Chrysler history of tarting up exteriors with gaudy chrome jewelry is in check here, too (chrome mirror caps notwithstanding). Even the very unusual slant of the D pillar and rear glass makes the Pacifica seem a little bit more upscale. I’m not as convinced about the interior styling, which, while dramatically rendered here in browns and blacks, feels a bit to nouveau riche in overall affect. The leather is nice enough for a minivan, but something in the contrast between those panels and the hard black plastic just makes it feel like the Pacifica is trying too hard. 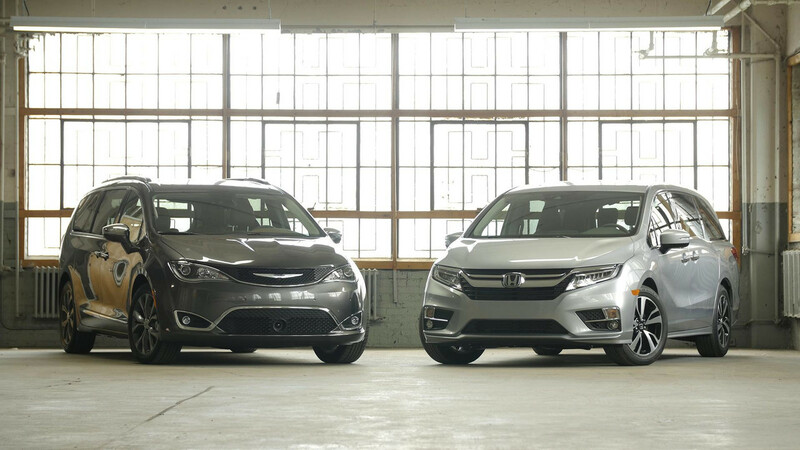 Honda: In contrast with the simple, sculptural surfaces of the Pacifica’s body panels, the Odyssey has a lot going on. 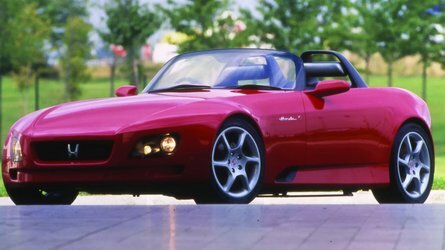 Three prominent creases in the bodyside compete with flattened wheel arches, a “floating roof” effect, and a very bold front grille for attention. I’ll admit that the Honda looks more handsome in person than it does in pictures, but with the kind of “characterful” appearance that is just the opposite of the Chrysler’s easy-to-understand good looks. Inside I feel right at home, however. This cabin has a very high-tech vibe blended with nice (sedate) material choices that feel both upscale and durable. There’s not the kind of wow factor you get with the Pacifica, but overall I like the low-key approach a little bit more. 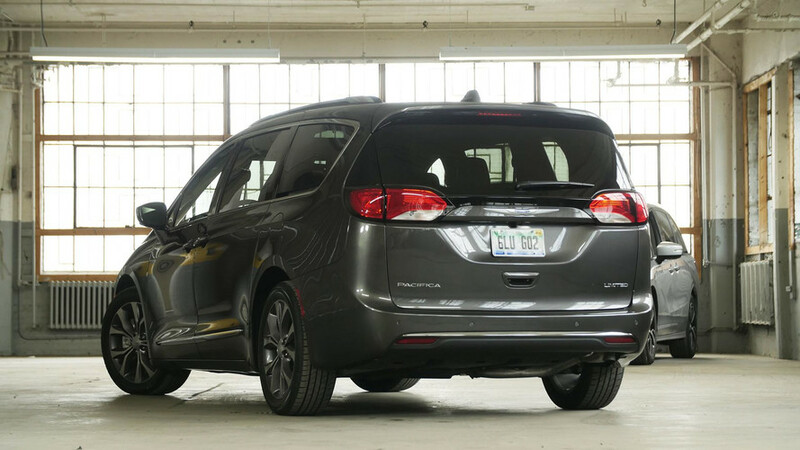 Chrysler: The Pacifica offers supple ride quality, with an excellent powertrain, all wrapped up in a very quiet package (at least before you add the youngsters in the back). I find this especially impressive in light of the ginormous 20-inch rolling stock – although those big wheels do cause some pothole-induced anxiety. Ample power is provided from the 3.6-liter V6 – 287 horsepower and 262 pound-feet of torque – which is meted out smoothly by the 9-speed automatic. Save for quick blasts up to highway speeds (where there’s not untoward squatting), I didn’t get a lot of joy from the combination of power and suspension response; the Pacifica stays out of its own way if you go around a corner quickly, but only just. 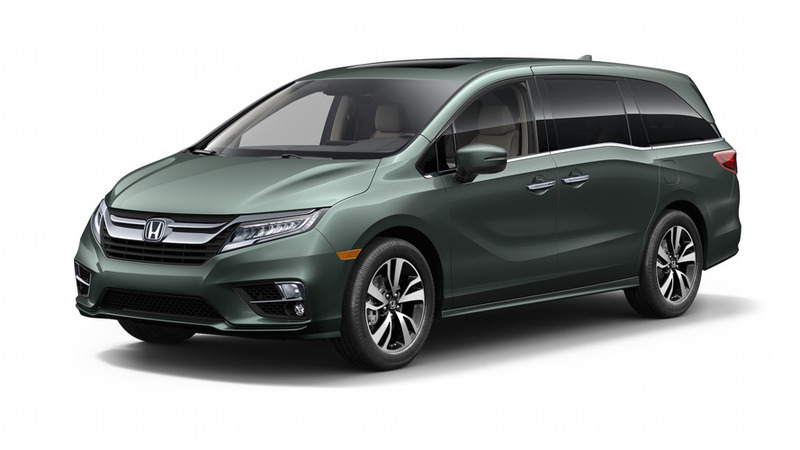 Honda: The Odyssey has a reputation as a “good-handling” minivan that is both well-deserved, and that carries on in this new generation. 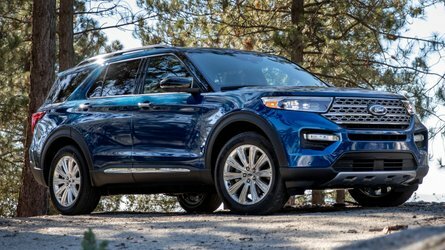 Certainly, designers and engineers would like to hammer home that rep; paddle shifters on the steering wheel and a low-slung seating position seem to back the sporty aspirations. And if any of that is important to you, the Honda does feel a shade stiffer in a corner, and more potent pulling out of it, than the Chrysler. Very similar output ratings from the 3.5-liter V6 – 280 hp and 262 lb-ft – nevertheless feel slightly stronger on the road, perhaps a result of the 10-speed automatic transmission having a sport mode and a propensity to downshift. The Odyssey doesn’t give up anything in terms of ride quality, either, though it might be just barely louder while cruising on the freeway. 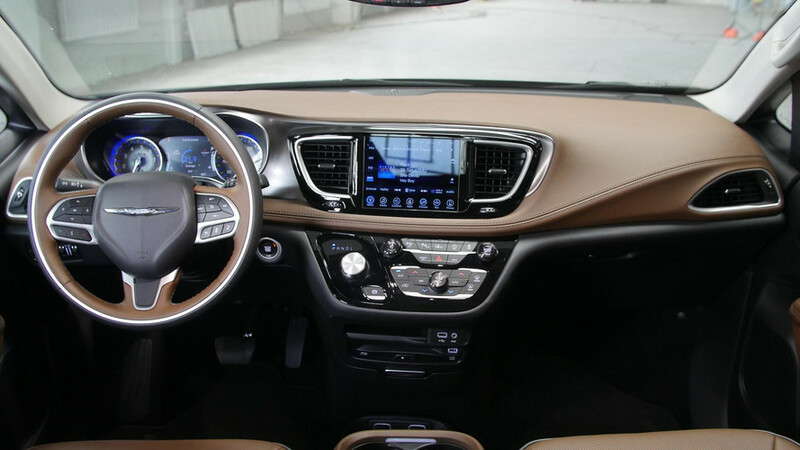 Chrysler: Trimmed with Nappa leather in a “black / deep mocha” color scheme, the Pacifica interior offers a lot more visual drama and glitz than the more staid Odyssey. “Wow, that’s a nice minivan” seems to be the default response from an average Pacifica virgin. A huge – nearly the full length of the vehicle – tri-pane panoramic sunroof makes the whole interior feel bigger and brighter when opened. 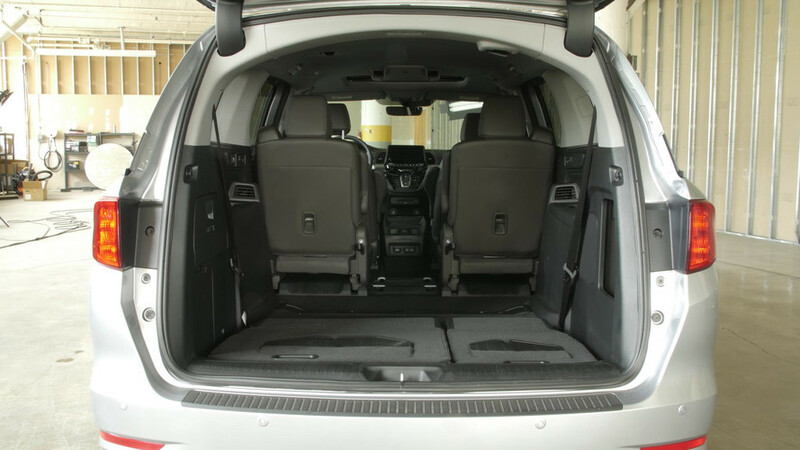 But minivans live or die by the functionality of their cabins, so allow me to rattle off a few numbers. The all-important cup holder count comes out to 10, though in complete fairness a few of these are a little shallow, and seem like they’d be of limited use. 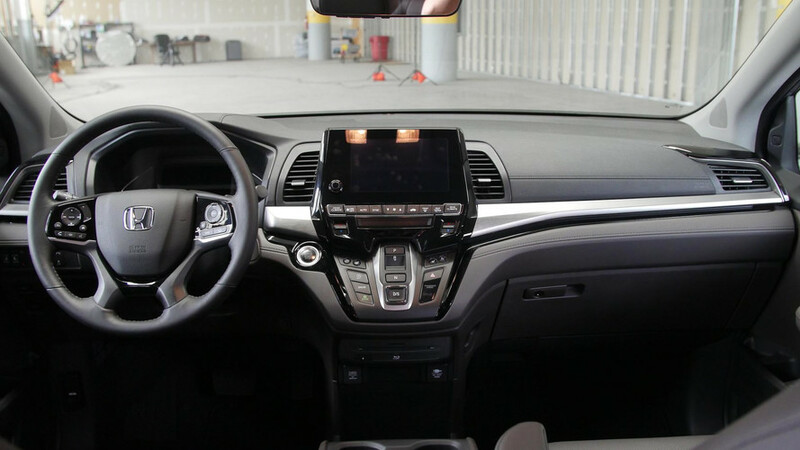 The $2,795 Customer Preferred Package nets twin 10.1-inch touchscreens (there are also touchpad remotes) for the second row seats, complete with wireless headphones. There are plenty of ways to jack-in and power-up, too, with five USB ports, two HDMI ports (one for each rear screen), two 12-volt ports, and one old-school auxiliary jack. 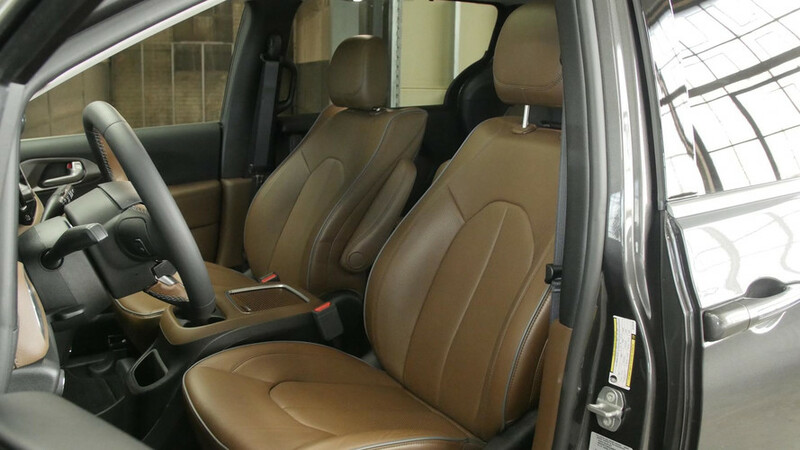 The Pacifica interior is entirely versatile, as well. Powered third-row seats fold flat into the floor with the press of a switch, as do now-famous Stow ‘n Go second-row seats (though they’re manually operated). If you regularly need the full back section of your van opened up into a flat floor, this is unquestionably the better vehicle. 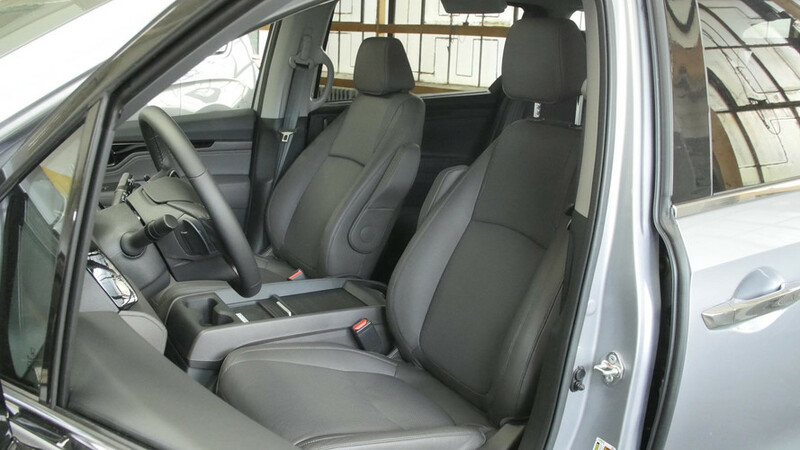 Chrysler also offers Easy Tilt second row seats; essentially these fold the seats forward and out of the way, with a simple pull of a loop, and allow for gracious entry into the third row. People with frequent passengers in the way back will probably care more about this access, than the ability to make a fully flat floor. And yes, it has a vacuum. Every minivan should have a vacuum. Honda: When compared with my test Pacifica, this Odyssey cabin immediately feels slightly dark and somber. Though a longer stint in the driver’s seat and a deeper look at the fit and finish also have me believing it will stand up to Father Time a little better. Honda’s black leather seats and techy center stack make the car feel understated and functional, though the single-pane sunroof can’t compete with Pacifica’s huge glass roof. Here’s the accounting of the Odyssey’s suite of stuff. To start, Honda offers a 115-volt plug that you don’t have in the Pacifica at all (I’m not sure if I’d count that as a game-changer or not), and there are three 12-volt ports, as well. There’s just one HDMI port, to service the one, central, fold-down rear entertainment screen. Honda’s screen is operable by way of a remote, and there are two headsets for independant listening. Odyssey does score the coveted cup holder victory here, with a count of 12 usable drink ports. A small but significant note: there’s a volume control for the third-row headphone jack. 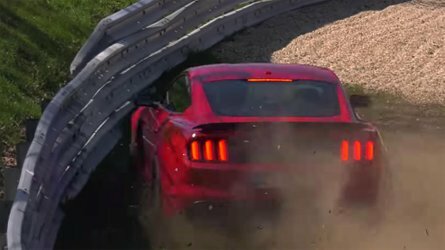 Honda has extended its Magic Seat idiom to both back rows of seating for 2018. Yes, the third row still stows into the floor with the pull of a nylon loop. It’s not a powered system, but it is faster than in the Chrysler: I was able to hide both seats with one hand, in under 15 seconds. But the second-row Magic Slide seats might just be the new Odyssey’s killer app. By squeezing a handle, one can move the second-row captain's chairs in towards the center of the vehicle, or out towards the doors, and lock either in a near-infinite variety of positions. 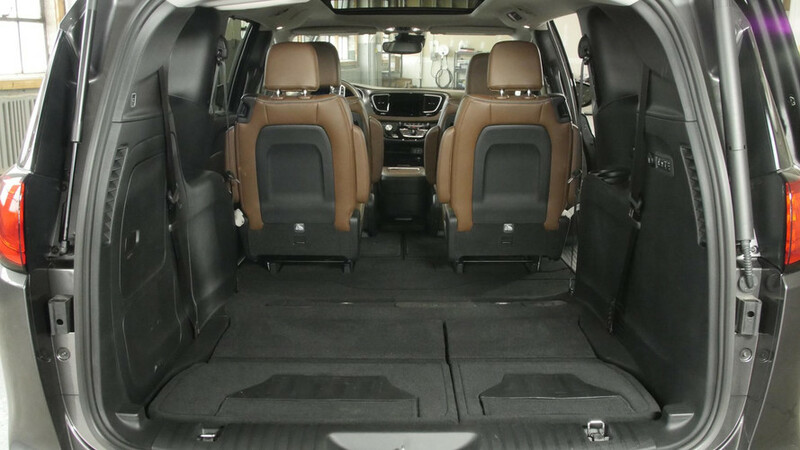 This makes access to the third row simple (with a wider possible lane than offered by the Pacifica, albeit slower in operation), especially if you typically have something like a car seat fixed in the second row. Meanwhile, the second row seats are removable, but do not stow, so creating a fully flat load floor requires space in your garage for the chairs, and a lot more elbow grease. The HondaVac vacuum is on hand for all of your spilled cereal needs. 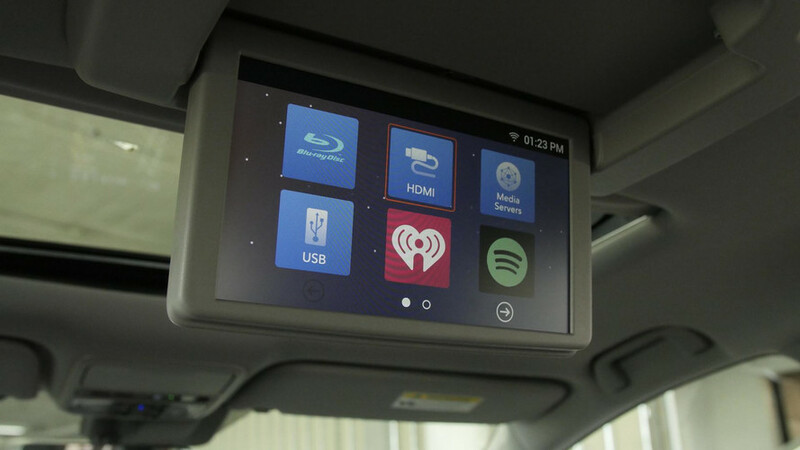 Chrysler: The Pacifica’s infotainment story is pretty nice: The driver gets a very slick Uconnect system upfront, and the near-business-class passengers in the second row get the aforementioned screens. Here, kids or adults can spend time playing mini games, watching movies (from lots of different media sources, thanks to HDMI and USB ports), or even hooking up a video game console for longer trips (though you’ll need a 12v converter to plug in, unlike the Honda). 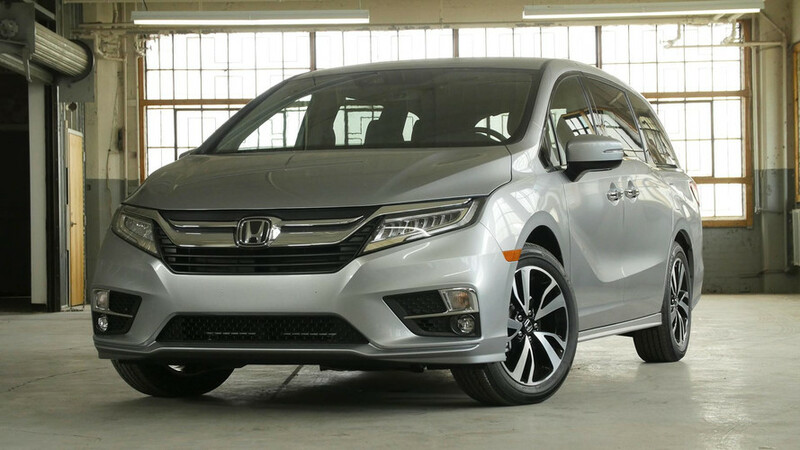 Honda: Thanks to a single, roof-mounted screen, the rear-seat experience is slightly less individualized in the Odyssey than it is in the Pacifica. 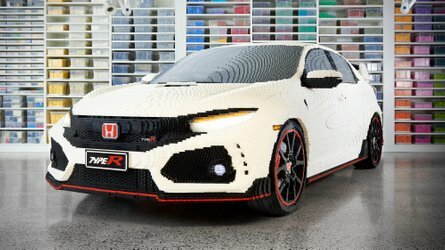 But the Honda makes up for it with a few innovations. I like the way the new, tile-based Display Audio system is configurable, to start, though it’s really about on par with Uconnect after setup. Honda does make it easier to get the family’s attention when everyone is plugged in. CabinTalk and CabinWatch systems let you amplify your voice through the vehicle’s speakers or headphones, and get a fish-eyed view of the second row, respectively. 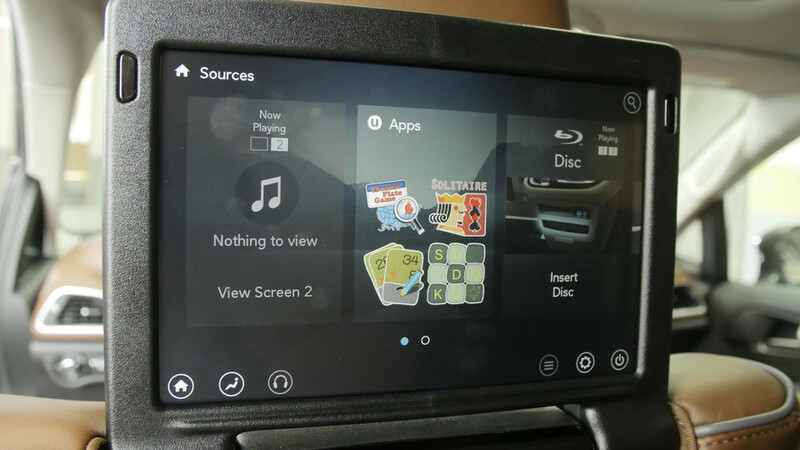 There’s also a smartphone app that’ll let anyone in the car add music to a digital playlist – seemingly aimed at more grown-up kids, or party-vanning adults. I’ve left this category in the comparison test, simply because it’s a high-level concern for minivan shoppers. But it’s not worth splitting into two blow-by-blow sections. This is basically a tie: Honda edges out Chrysler with 28 highway, 19 City, and 22 Combined, versus 28/18/22, respectively. One big caveat is that Pacifica also comes as a hybrid model, albeit for a few thousand dollars more (before a substantial tax credit) than this very highly specified Limited example I’ve been driving. The hybrid version, with a combined econ rating of 32 mpg, is clearly the champ of the segment, where fuel economy is concerned. Chrysler: The Pacifica Limited trim has an MSRP of $42,895, and my tester is loaded with the big media pack that gets you rear entertainment and the better sound system, along with a nearly $2,000 safety package that nets things like an around view camera, adaptive cruise, collision and lane departure warnings, etc. 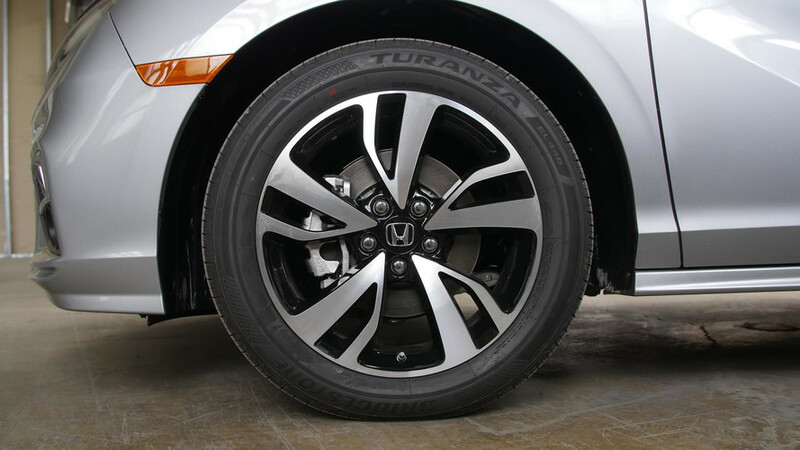 Just for fun, I’ll leave off the 20-inch wheel/tire package ($995) since the Honda rides on 19s, and speculate an as-tested price of $48,780. That’s about a grand more expensive than our test Odyssey. Of course, you might be more likely to find a bit of a deal on a new Pacifica if you look around (in my area lease deals seem limited to the lower trim level vehicles). The counter argument there is, if you’re a buyer, big incentives are likely to drive down your residual value. 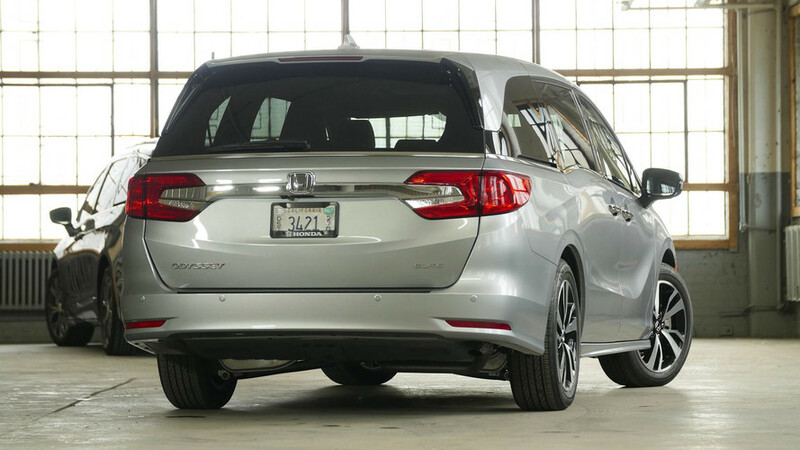 Honda: The Odyssey Elite comes with the Honda Sensing package, adding in most of the safety tech features you’ll have to option into on the Chrysler. In fact, the Elite doesn’t have any options on it at all; the MSRP of $46,670 plus destination and handling fees of $940 add up to total price of $47,610 with a list of features very similar to the Pacifica’s. Expect the Odyssey to be a better long-term buy, with a rosier outlook in terms of cost-to-own for your tenure with the van.